In the years that I’ve written this blog, I have written many articles highlighting the history of the physical assets in the region, but as I’ve exhausted many of my sources, and my access to new sources has become more difficult post-graduation, I’ve tended to focus on new development in Ithaca and the colleges. I’m not saying that it’s necessarily a bad thing, but there are occasions where the acknowledgment of historical assets must be given its due. When I visited for my last photo tour back before New Year’s, I came across an aging Greek Revival house on the north end of downtown that was in a deplorable state. 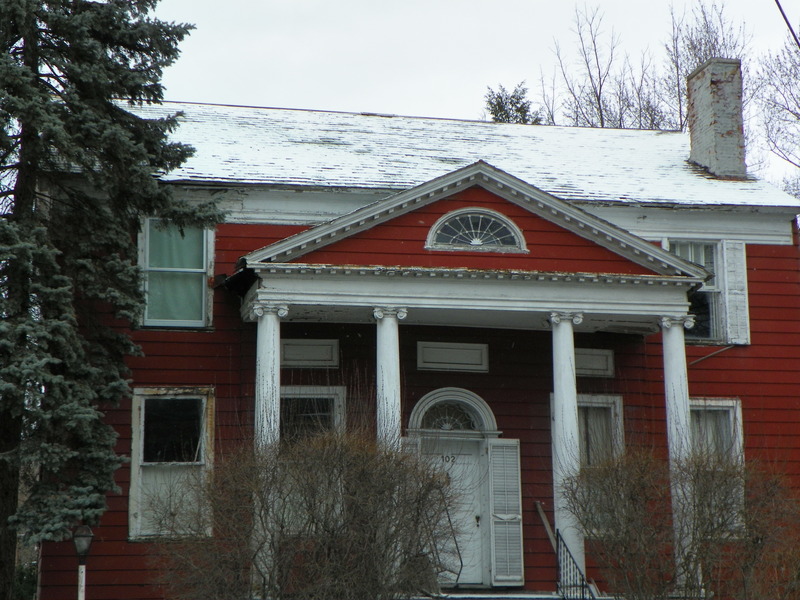 The red siding was tired, the Doric columns of the porch chipped with the paint worn off, the foundation crumbling and the windows damaged, with sills breaking off, and missing panes in some places. I resolved that before something happened to it (most likely the wrecking ball), I was determined to take a few photos and share the house before it becomes confined to the old yellowing photos of times long ago. Officially, the house is 102 East Court Street. Historically, the house is the “Judd House“. 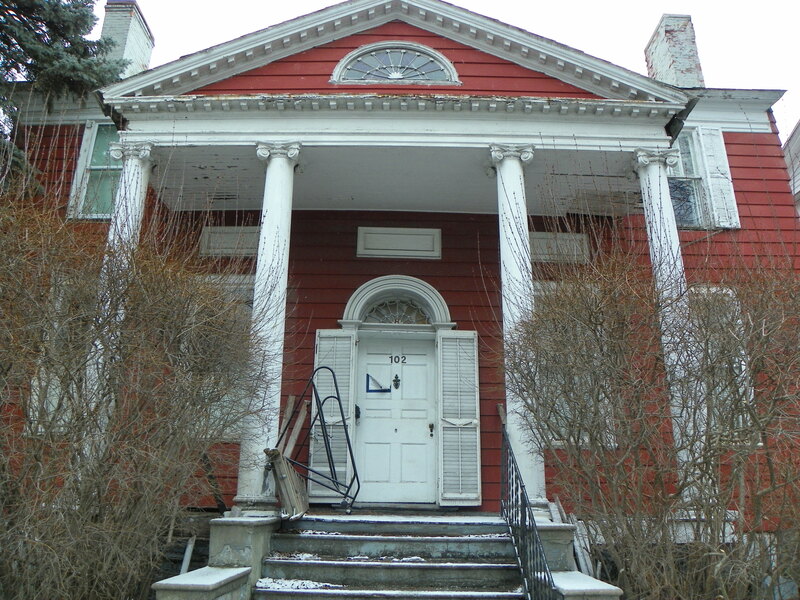 The house was built in 1828 – the same year Ezra Cornell had arrived in the budding town of Ithaca, which has hardly twenty years old. An estimate establishes the house as having about 3,100 sq ft, 4 bedrooms and 1.5 bathrooms. Furthermore, the assessed value of the house is $190,000, although given its condition the land it sits on is probably worth more then the physical plant itself. 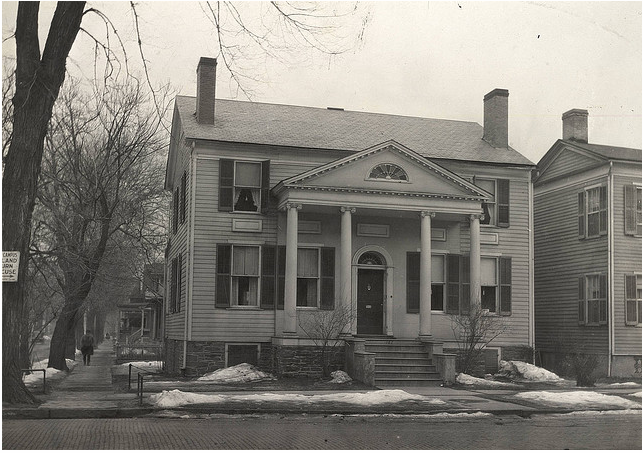 A casual online search reveals a photo from Cornell’s A.D. White Collection, which shows the house in a much better state of affairs in what the vehicle to the left suggests is the 1920s. Furthering searching indicates the house was most likely designed by Ira Tillotson, the same architect for the Clinton House, which is a contemporary to this home. The once-stately residence was built for Capt. Charles Humphrey, a veteran of the War of 1812, on what was then the corner of Cayuga and Mill Street. The house and a long-removed barn were constructed for a cost of $2,105.56, which places the cost of construction likely somewhere in the upper six digits to $1 million-plus today. The name Judd House comes from long-time owners of the house in the 1900s, who apparently took great pains to keep the house in good shape. Sadly, that is not the case today. In a perfect world, someone would come along and renovate and restore the venerable house to its former glory (perhaps INHS? A Cornell or IC faculty member with ambition)? 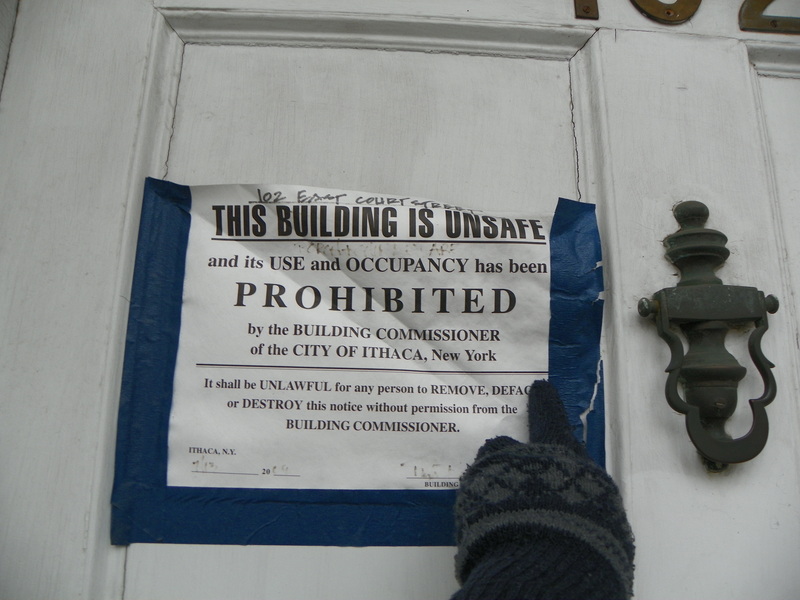 It would be a shame to lose such an asset to Ithaca’s history. However, the decay is advanced and renovation would be expensive, or may not even be viable given the precarious state of the foundation, which is continually harmed by the freezes and thaws of the Ithacan year. As time creeps forward and winters take their toll, the long life of this home may be coming to end.